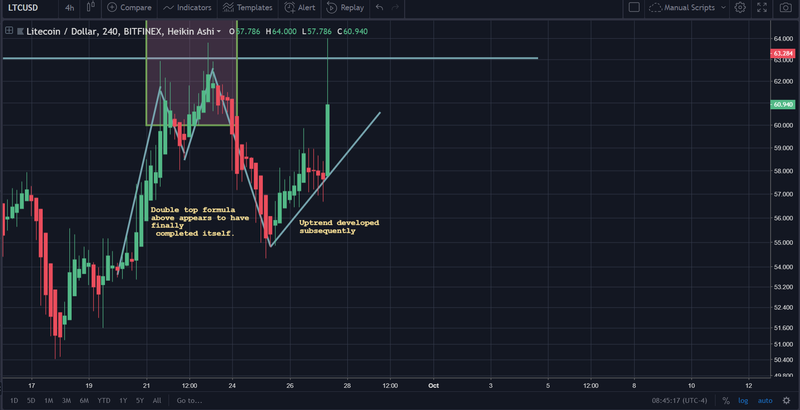 At the time of writing, it appears that Litecoin has finally gained some level of momentum in the markets after consolidating for a number of days. This is notable because, among its peers (other coins in the T10), Litecoin has been posting a solid performance. 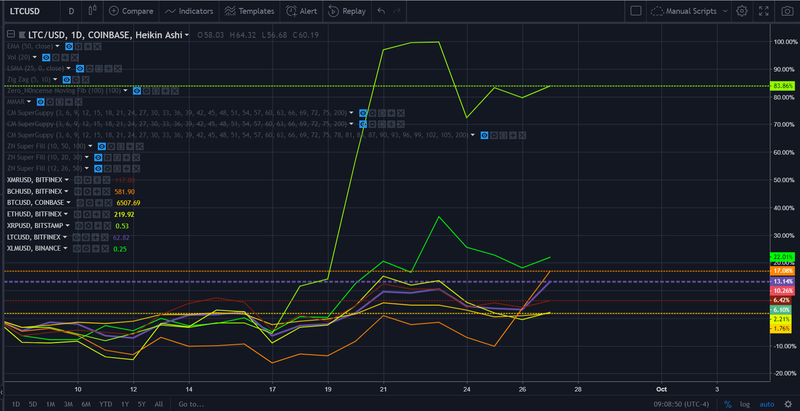 This is reflected in the chart below, which provides a comparison among the coins; Litecoin, Ethereum, Ripple, Bitcoin, Bitcoin Cash, Stellar Lumens and Monero on a price scale that adjusts the scale of the prices to a 100 max in order to render a valid comparison (because you can’t compare a $60 Litecoin to a $6,500 Bitcoin). Litecoin is currently ranked 4th among ‘competing coins’ in the T10, which places it exactly in the middle of the pack among our 7 coin sample behind Stellar Lumens, Ripple, Bitcoin Cash (which recently surpassed it in performance). Conversely, Litecoin is currently above Bitcoin, Monero, and Ethereum in terms of price movement. Litecoin’s performance as of late has picked up some steam. However, in terms of its ‘rank’ among the 6 other competitors on our list, Bitcoin Cash’s recent performance has outpaced it in a number of ways, leaving Litecoin in the middle of the pack in terms of $$ appreciation. In an unrelated note, its worth pointing out the observation that Bitcoin is currently at the bottom of this list. Above is Litecoin on the H4 chart. As the above two pictures show, there was an ever so slight double-top pattern that concluded around September 25th, that was followed by an abrupt uptick in the price, followed by a sudden breakout on the chart’s most current candle (at the time of writing). As noted in earlier price analysis articles, its never a wise idea to trade upon data that is formulating at the moment. Thus, the notes that are drawn in the pictures above are only for educational/entertainment purposes. 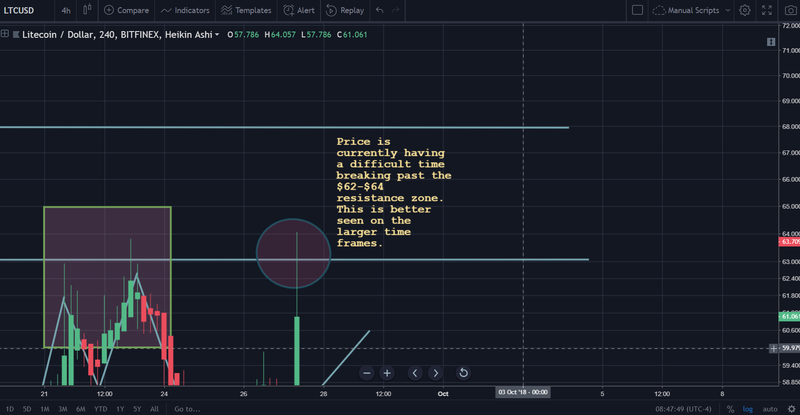 The indicators, however, yield more useful information about the underlying price movements for Litecoin over the last few periods. As noted in prior documentation, this is a custom indicator. Using the principle of the Balance of Power, this indicator is able to dictate when there is immense selling pressure and, conversely, when there is accumulation. From the chart above, its apparent that there was a heavy undercurrent of accumulation among traders while the price was consolidating. When this occurs, this is almost always a precursor to noteworthy gains in the near future. While the daily is substantially more bullish for Litecoin (USD pairing), we can still see the major undercurrent of accumulation here as well. Volatility has been slowly increasing over this time period as well after reaching a low a few weeks ago, and it appears that the price of Litecoin could be poised to make some further sustained gains in the market. 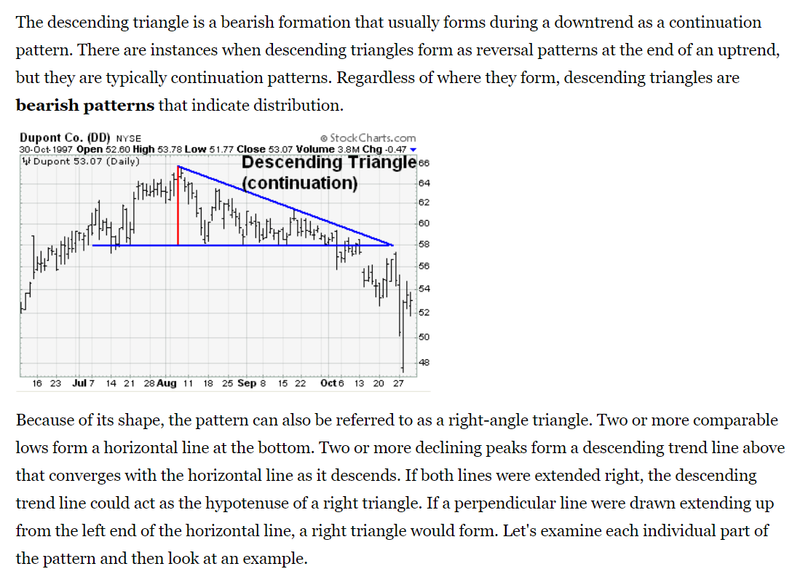 Convention states that this would be a continuation pattern. So, in this situation, that means that the price is supposed to break downward. However, the price could go either way. Given the formation of the descending triangle formation in conjunction with the underlying bullish sentiment on the chart, the future of Litecoin’s price action is fairly ambivalent at this point. However, if Litecoin manages to break out above the downtrend line (that it is currently trading against, depicted in the photo above), then the price gains from that point moving forward could be substantial. There are other points of analysis that traders must look at before considering themselves ‘educated’ on the possible price action moving from this point. However, if a trader has sufficiently hedged their risk on the market, then they should be safe.